Jessie Raeder is Bay Area Organizer for the Tuolumne River Trust. More than 200 paddlers are expected to take to the river between now and June 7, for this river awareness relay. Raeder offers this dispatch from the starting line, near the headwaters in Yosemite National Park. Paddle to the Sea got off to a roaring start over the weekend. Melting snow caused by an early heat wave in the Sierras had the river pumping at much higher flows than rafters typically face. The Tuolumne is usually rated Class 4–but goes to Class 5 when flows get over 4000 cubic feet per second. This weekend saw the river flowing at 7000 cfs! For a while it looked like we might have to cancel all the whitewater trips due to safety concerns, but in the end one trip did go on and needless to say it was an epic journey for our Paddle-to-the-Sea team. Meanwhile, an international team of 12 hotshot kayakers ran the Clavey River, a tributary of the Tuolumne and one of only three remaining free-flowing rivers in the Sierra. The Clavey is a class 5+ river that’s rarely run and only by experts. Paddle to the Sea is a three-week festival to foster stewardship of the Tuolumne River. Hundreds are joining in this epic journey from the Sierra to the Sea. 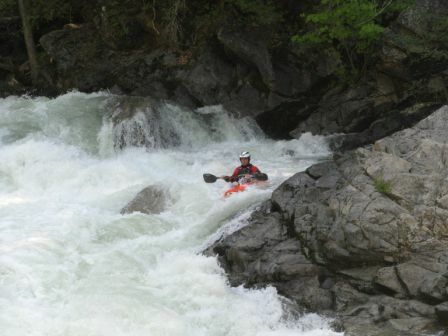 Kayakers and rafters will begin on the upper stretches of the Clavey and Tuolumne Rivers, travel through the Central Valley where canoers take the lead, pass through the confluence of the Tuolumne and San Joaquin Rivers, and sea kayakers will finish the trip in San Francisco Bay. A changing and increasingly unpredictable water supply will be the first way that most people in California experience climate change affecting their own lives. Here in the Bay Area, tap water for 2.5 million people comes from the Tuolumne River, whose headwaters start with melting snow from the Lyell Glacier (picture attached). That glacier is on the retreat, and more frequent droughts are expected throughout the Sierra. Paddle to the Sea is meant to demonstrate that issues that affect one section of the river ripple up and down the watershed. Bay Area water users share this resource with farmers in Modesto, anglers in Yosemite, the commercial salmon industry on the Pacific, and a host of native fish, plant, and wildlife species, many of which are endangered. As population and demand for water continues to grow, California will be faced with many questions about how we use water, and where it will come from. The Tuolumne River Trust is working to ensure that we turn to water efficiency and water recycling as much as possible–alternatives which are far more sustainable and renewable than continuing to take additional water from the Tuolumne River, which has been the solution most turned to in the past. Wow – This Tuolomne River Paddle to the Sea is inspiring and looks fantastic! Gorgeous waters and riparian ecosystems. What an excellent way to raise awareness about the dwindling Lyell Glacier, the need to preserve the Tuolomne and other remaining free-flowing rivers from the Sierra, the impact of global warming, and the need to recycle our water! I believe there’s still time to sign up. Follow the link in the post to the Tuolumne River Trust website. Prev California's Water Meter Rebellion Withers Next New Tailpipe Regs are an "Alternate Reality"